We want you, our Grab customers, to know that we hear you, and we’re here to answer your questions as best we can. In this first instalment of a monthly #AskGrab series, we tackle your top questions about pricing on Grab’s ride-hailing platform. One of the biggest challenges when it comes to pricing is balancing the opposite expectations of passengers (lowest fares, fastest allocation and low wait times) and drivers (maximum earnings). Our role is to find the right price point, at any one place and time, for both sides. We hope this blog post explains how our pricing works better. Q: Why have fares in Singapore increased compared to the beginning of the year? As commuters ourselves, we share the pain of some passengers who have experienced higher fares since the Uber acquisition on March 26. We want to assure you that we have not changed our pricing structure since January 2018. Our base fare has remained at $2.50, with a $0.50 per km and $0.16 per minute rate. We always publish our fare table: https://www.grab.com/sg/justgrab/. As we have not changed our pricing structure, to figure out what is causing price changes, we dived into the stats and realised that commuting patterns have changed as more ex-Uber passengers in Singapore started using Grab. The demand-supply balance has shifted in different neighbourhoods. 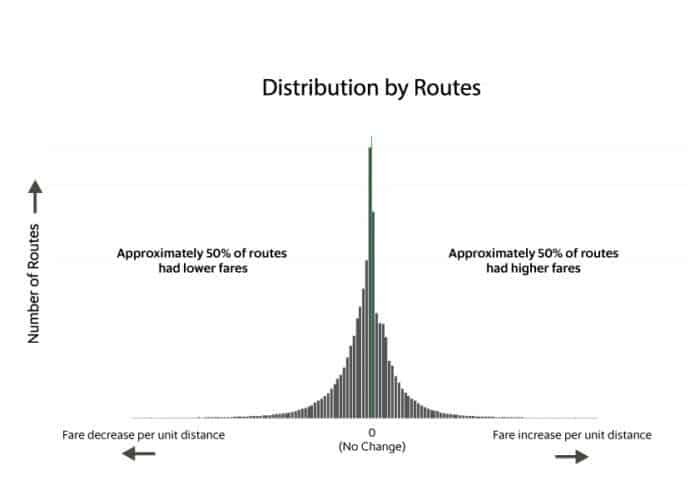 About 50% of routes did see median fares increase, while the other 50% of routes had a decrease in median fares. Chart showing equal number of routes with higher and lower fares. Q: Why are Grab’s fares sometimes higher than taxi fares? Our data shows that in 3 out of 4 fare checks, JustGrab (fixed fares) is cheaper than the Standard Taxi option (estimated taxi metered fares + taxi booking fee) in the Grab app. For the other 1 out of every 4 fare checks, pricing “surge” has kicked in to balance demand and supply (see next question). 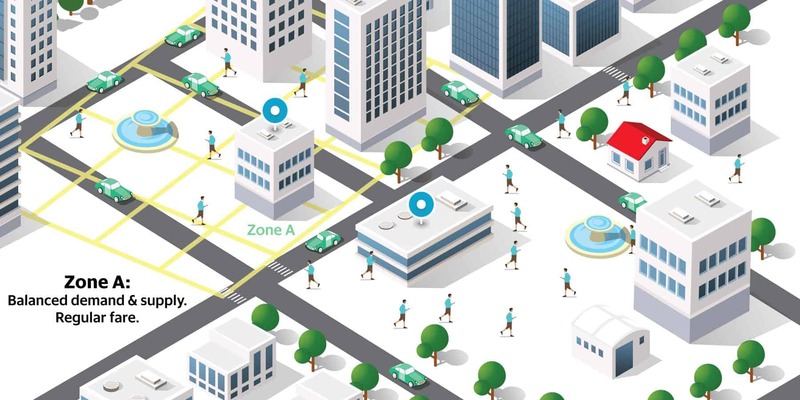 JustGrab was started because we believe that by bringing private-hire and taxi drivers together, we can help to close the demand and supply gap in Singapore, especially during peak hours when demand outstrips supply by many folds. Our taxi driver-partners from all taxi operators in Singapore (except ComfortDelGro (CDG)) can opt to accept jobs for both JustGrab and Standard Taxi bookings. While our goal is to work with all taxi operators, CDG drivers cannot register to take JustGrab bookings. Regulations do not allow for drivers from taxi operators who prefer not to be our partners to do so. CDG drivers can still use Grab’s Standard Taxi option to receive customer bookings. Q: Why is the surge fare so high? Our main priority is to make sure you get a ride as fast as possible. We call this ride allocation. “Surge”, or “dynamic pricing”, is a tool to improve allocation. When there are more people booking than the number of drivers available in an area – e.g. during peak hours, rainy weather, or in more secluded places – fares “surge” or go up to encourage more drivers to head to you. The aim is for you to get a ride faster, and drivers who make the trip to places with higher demand get to earn more as well. This is why passengers would find it a lot easier to get a ride today compared to when Singapore only had taxis running on metered fares. In July 2018, all private hire car drivers in Singapore were required to obtain a Private Hire Car Driver’s Vocational Licence (PDVL). Only 51% got their PDVL and many drivers dropped off the system and were not able to drive. Some of those who dropped off were part-time drivers, so Grab’s supply did not drop by exactly half. However, shortly afterwards, some passengers did indeed experience more fare surges. For Grab, passenger feedback was mixed – some were comfortable with surge, as they were able to get assigned a car quicker, despite the total number of drivers being lower. However we’ve also learnt that not all passengers prioritise allocation, and may prefer to wait a bit longer for a ride or take another service, instead of paying a much higher fare when pricing surges. We’re sorry if we’ve ever shocked you with too high a surge fare. This system is fair to our drivers, yet we recognise a need for a reasonable upper limit in terms of fares charged to passengers. We have a surge cap in place, and are continually working to keep fares within an acceptable threshold. Q: Does Grab earn more with higher surge? Grab collects a fixed 20% commission from the fares that drivers receive, so 80% of any fare (including fare increases) goes to drivers. Given that JustGrab fares are usually lower than Standard Taxi metered fares, surge helps drivers make a sustainable living. Our data shows that 17-25% of driver-partner’s gross incomes are from surge fares, where they specially make a trip to high demand areas to pick up passengers. Q: What options do I have if surge fares are not acceptable? We’ve added a travel trends widget in your Daily Feed in the Grab app that shows the fare trend from your chosen pick-up point, in half-hour blocks on any given day. This is based on past data over the last two months. If you have some flexibility in your schedule and don’t mind waiting a while before booking your ride, you can refer to the widget to estimate when fares would be low. Travel trends widget in the Grab app. You can also choose other transport services that are not affected by dynamic pricing, such as Standard Taxi (taxi metered fare) or GrabHitch, which is a social carpooling service. If you don’t mind sharing a ride with others at a lower fare, you can also choose GrabShare, our carpooling service. We’re also piloting more alternative transport services that will bring down costs for passengers, such as on-demand shuttle buses and e-scooters. These services are still point-to-point, but are cheaper if you don’t mind sharing a ride or zipping along on an e-scooter. Q: Why is there a difference in fare when I book at the building next door? Neighbouring zones can have different demand-supply conditions. To calculate fares, our pricing algorithm divides Singapore into many small and identical zones on the map, following latitude and longitude lines. Hence, two pick-up locations that are near each other can be in two different zones, which may have different demand and supply conditions at any one time. This does mean Building A may show a different fare from Building B, even if they are nearby. We know the fare difference in some cases are large, and we are working on ways to reduce variance in fares between two such zones.